A lovely new handmade addition to our Medieval Banquets..! Expertly handmade by the lovely Bribie Island local Potter Bev Porter (as shown above), these new Banquet bowls have been made to specifications required for a medieval feast! These bowls will be used for the salads, and will stay on the tables throughout the Medieval Banquet nights, so our guests can ‘pick’ throughout the evening, taking second and maybe even third helpings! Courtesies and manners, gallant words and gaudy tales of old! The touch of rose water to cleanse your hands in preparation for your night ahead. Leave with full stomach and possibly wake up with a sore head! 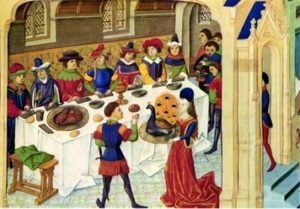 Whether you have never been to a Medieval Banquet before, or if you are a regular guest, don’t miss this years Medieval Banquets – a true feast for all your senses! Buy your tickets now as we are almost ALL SOLD OUT! Subscribe to our newsletter to stay up to date with all things Banquet and Festival! Have a question you need answered that you just can’t find on our website? Below is list of some of the most common questions we have been asked this year. Chances are, you will find the answers you need here. Yes, you can, just no alcohol. We have our own Tavern on site for this! What does our ticket entitle us to do? Your general entry tickets entitles you to visit and view everything inside the Festival, with the exception of the VIP area, and the Jousts. You can buy VIP tickets to enhance your experience even more, and you can buy Joust tickets, for any of the Joust sessions. When you are roaming around the Re-enactor encampments, please feel free to view the camps and ask as many questions as you like. Many of the encampments have workshops and displays as well. Note the encampment etiquette though, and remember that real people are living in these real camps, with their own real food and personal items. Do not enter any personal space and do not eat any food that isn’t specifically for the public. If you are unsure of something, ask! What children’s activities are available? There are many activities, shows and displays for children of all ages. See our suggested itineraries for some of the activities available, and the final program will outline everything on offer as well. If I purchase a weapon on the day, how do I get a permit for the day? After purchasing your weapon, you will need to head straight to the Security Post and complete some paperwork to obtain the permit. Is a health card a concession? Yes it is, see our list of the concession cards we accept. What time is the Knighting Ceremony on? The Knighting Ceremony is held on the Friday night before the Festival (8th July) at 7:30pm, in the Abbey Church. We can’t find the banquet menu on the web page. The Banquet Menu is on the Medieval Banquet page. You can find the menu here as well. When will the program be available so we can plan our day? The program will be available on the website by the end of May. You can also view our Suggested Itineraries for some of the activities and shows on this year. Will there be first aid personnel on site? Yes, there most certainly is a team of trained first aid personnel on site all weekend, as well as a security and crowd control team. Bought your tickets yet? If not, buy them today! The Abbey Medieval Festival will make a major change regarding bottled water at this years Festival! This year, the Abbey Festival will drastically reduce the amount of bottled water being sold INSIDE the Festival gates. None of the actual market stalls will be selling BOTTLED WATER. Wait, WHAT? No bottled water you say? What we mean by this is, in a step towards a more SUSTAINABLE and environmentally friendly solution, we will no longer be allowing any of our Medieval Market Stalls to sell bottled water (Mt Franklin, Pump, etc). To make this transition smoother, for this year, there will be “pedlars” roaming around the Festival selling some bottled water, as well as selling some recycled and reusable bottles for you to buy. There will also, most definitely, be access to FRESH, COLD WATER, at any of our 3 new water stations that will be set up at 3 different spots around the Festival. The Unity Water Hydration Station will also be onsite for you to fill up at, you just need to bring your own drink bottle, or purchase a reusable drink bottle from either the Museum Stall inside the Festival or inside Downtown Abbey (Sponsors Village before you enter the Festival). These water bottles will be sold for $5, which will go straight back to the Museum, and the water re fills from the stations are completely FREE all day. WHY are we doing this you ask? There are many reasons for this decision being made and trialled this year. These reasons include the obvious effect these plastic bottles has on the environment when not recycled. Did you know that these plastic water bottles take up to 1000 YEARS to break down? And that “recyclable” water bottles are one of the 10 most COMMON pieces of LITTER just left on the ground, in drains, and worse, in the ocean? If we, as an Australian organisation, can have even a small part in the minimisation of bottled water at big events like the Medieval Festival, this is our way of doing our bit. We look forward to our valued visitors and friends supporting us in this decision, and doing your bit too, even just for the day. Subscribe to be the first to hear about changes like this!